Of the three products covered in this review, the Grid Connect ConnectSense Smart Outlet is unique. Measuring approximately 5" X 3" X 1 3/16", it features two individually controllable outlets. You can also monitor the power for each outlet separately and each outlet has a different Siri name (defaults names: Outlet 1 & Outlet 2). On the right side of the outlet (photo at the top of the review), there are individual switches for manually turning each plug on or off. Immediately to the right of each outlet, there's a blue LED to indicate power status. Each LED is dimmable. Also on the top of the unit are LED indicators for status and Wi-Fi. Those LEDs are only used during setup, and remain off in normal operation. On the left side of the outlet, there's a single 2.4A USB charging port that supports rapid charging for Rapid Charge-capable iPhones and iPads. The USB port frees up an outlet and eliminates the need for an individual charger. Since the ConnectSense has two outlets, you would think its rear three pronged power plug would be positioned so that the new outlets lined up with the outlets they block. Instead, the ConnectSense ends up being offset slightly above or below wall duplex. Setting up a HomeKit device is fairly simple, but the ConnectSense differed slightly from the other two. With your iOS device connected to your home Wi-Fi network, the quick start guide directs you to go to Wi-Fi settings. If you scroll down to the bottom of the list of wireless networks on your iOS device, you'll see "Accessory Name" along with a unique name for your ConnectSense outlet. If you click on that, the ConnectSense outlet will automatically be configured for your default Wi-Fi network. After connecting to your network, the ConnectSense program will ask permission to access the HomeKit data on your iOS device. To finish setting up the device, you click on the "+" icon to add it and select the unconfigured ConnectSense device. A window will pop up that either allows you to manually enter a unique eight-digit code or use your iOS's camera to frame the number to scan it in. The code is included on a separate insert in the package and also appears on the bottom of the plug. This code allows the ConnectSense to set up an encrypted peer-to-peer connection between the outlet and your iOS device. Note: Each of the three SmartPlugs in this review used the same registration method (scan or manually enter) to create the peer-to-peer connection. When you launch the program after completing the installation, you land on the Devices page that shows all of the installed HomeKit devices in the HomeKit database on your iOS device. There are four HomeKit devices in the screenshot below, with each device organized under its assigned room. The ConnectSense Smart Outlet is in the Living Room with the default name. This name shown may or may not be the name that's recognized by Siri. In the case of the other three devices, I've given them other Siri names. While those names don't appear here, you can check or reconfigure the Siri name for any HomeKit device from within the ConnectSense app. You control the ConnectSense's state using the outlet toggles. For other manufacturer's products, you can't tell the status of those devices nor turn them on/off unless you open up the device detail page for those products. Using the ConnectSense app, I confirmed I was able to successfully turn on/off the outlets on the other two Smart Plugs covered in this review as well as the previously reviewed iHome SmartPlug ISP5. If you tap on one of the ConnectSense outlets, a detail screen for that outlet appears. From that page, you can turn the outlet on/off, check the average power consumption and the "on" time, change the device's name and type, and change the brightness of the associated LED indicator on the ConnectSense outlet. If you slide the power outlet data strip to the right, it shows the actual current power usage. The screenshot below shows the detail page for Outlet One. The amount of energy usage data available in this version of the ConnectSense app is quite limited. There isn't any historical tracking nor are there any estimates of costs. Grid Connect said these issues are addressed in its iOS 10 app version. Across the bottom of the each screen in the ConnectSense app, you'll find a navigation bar that takes you to other sections of the application. I'll briefly describe each. This menu takes you to the Home hierarchy. You can have multiple Homes, each with rooms, zones and service groups. In this menu, you can add/change/delete rooms, zones and service groups. Here you add devices to rooms, and you can add rooms to zones. For the purposes of this review, I created two zones (first floor and second floor), and three rooms (living room, office, and bedroom). Using Siri, you can control individual devices by name, control devices by zone name (Siri, turn off the first floor), or by room name (Siri, turn on office). Siri also recognizes and executes scene names. Scenes allow you to create an event that performs specified actions on individual devices. You can activate a scene by tapping on the activate icon shown below (left), or using Siri. For example, with Siri listening, just say "Good Night" and that scene will be executed. The "Good Night" scene (right) turns off all devices when activated. Note: for other manufacturer's devices, the Siri name appears below the device name in the screen configuration example below. The Siri name for the Eve Energy device is "Fan", for example. I created scenes using each of the applications for the other manufacturer's products, and I was able to edit and execute any of the scenes using the ConnectSense app or via Siri. The rules menu allows you to create rules based either a timer or and event. Each rule can be enabled or disabled. The timer event is the simplest form of a rule. For a timer event, you create a trigger time, set the frequency for repeating, and select a scene or multiple scenes to activate when the trigger timer is reached. In the example below, I attempted to set up a rule that would turn on everything at 9:00am on weekdays. I had no problem configuring the timer, but under the repeat configuration, my options were Never, Hourly, Daily, Weekly or Monthly. I wasn't given the option to select the individual days of the week for the schedule to run. Nor could I use the Timer to create a schedule based on sunrise/sunset. Interestingly, I discovered that I couldn't delete a rule from within the ConnectSense app once I had created it. You can also create a rule based on an event. The form is, "If" trigger, "When" constraint, For the "Then", you specific a scene. Sound confusing? I thought so. I played around with it and created an event. The trigger was "power state on outlet On for 3 minutes". The constraint was "since sunrise". I set the scene to "ConnectSense Outlet 1 Off". So, to summarize, if the power on outlet 1 is on for 3 minutes after sunrise, turn it off. The logic in this rule keeps running, so if you turn on Outlet 1, the rule will turn it off again 3 minutes later if it's after sunrise. You can add other constraints, but those are limited to whatever states of other devices that the ConnectSense app knows about. For example, you could add an additional constraint "If the iHome Smart Plug is On", and both constraints would have to be met for the action (scene) to be executed. You can also multiple scenes to be executed if the rest of the conditions of the rule are met. The event-based rule ran as expected, but I feel that setting up a conditional rule isn't immediately obvious. There's not a user manual, and the FAQs on the ConnectSense website don't provide any examples of how to create an event. The gallery below shows a few screenshots from the event rule creation. The settings menu is a bit of a misnomer. There are only two sub menus. One allows you to invite people to share control of HomeKit accessories in your home. The other menu provides examples of things you can say to Siri to control a device or to activate a scene. Elgato's eve Energy Wireless Power Sensor & Switch looks similar to the Koogeek switch reviewed next. Yet, it has several design advantages over its competitor. First, there's a switch on the front of the plug that glows green when the outlet is on and also acts as a hardware reset button. Second, the AC power plug is offset to the upper third on the back of the device. This allows you to plug it into a duplex socket and not cover the second outlet. If this is the first HomeKit device you're installing, just tap "add accessory" on the eve Energy app and follow the instructions that appear on the screen of your iOS device. Like all three SmartPlugs reviewed here, you'll need to either enter the eight-digit code manually or use the camera on you iOS device to scan the number which appears on the back of the eve Energy quick start guide. If this isn't your first HomeKit device, just tap the setup icon at the bottom of the eve Energy app and then tap the "+" key to initiate a search for your new Switch & Power meter. When you first launch the eve Energy application, you land at the Rooms page. Listed on the left are the zones (first floor, second floor) and the rooms that belong in each zone. On the right side of the screen, you'll see details for each of the devices, or accessories as they are called in the HomeKit world. In the rooms, the accessories appear with their Siri names to make it easy for you to control them using Siri from here. The eve Energy Smart Outlet has the Siri name "Fan" along with a corresponding fan icon chosen from an icon library. You can configure the data that appears on this screen by clicking on the Edit icon located in the upper- right corner of the screen. For the purposes of the screenshot, I'm displaying all available data for the eve Energy "Fan". The iHome Switch also resides in the Office, but it is a switch without power monitoring capabilities. The only option other than power, was "in use", which scrolled off the screen. There's a lot going on in the image below. To create this image, I clicked on the edit button in the upper left corner, and I toggled the expand directory ">" that appears next to the Project Cost, Total Consumption, and Total Cost menu items. Here's what's going on. On the left side of the screen, you can see the rooms (top) and how many accessories are in each room. At the bottom of the screen, you can see the configured zones and the number of rooms in each zone. You can change the orders of the Rooms or Zones, and you can change the which rooms belong to each zone from this menu. To change which accessory is assigned to each room, you need to go to Settings>Accessories>Room and reassign it. This is also where you can edit the Siri name for each accessory. Looking at the right side of the screen, you see the projected cost is estimated on day usage. You can also project the annual cost based on a minutes average or a weekly average. Total consumption shows that about 2.5 KWh have flowed through the switch since I started testing it. The bar graphs can be dragged to the right showing the previous history. Similarly, the Total Cost is based on the total KWh used multiplied by the rate energy that I set - $0.181/KWh. There's even more detailed information available than is shown on the graphs. If you double tap the date bar under either the Total Consumption or the Total Cost graphs, additional more detailed information will appear. You can view bar charts with views for an hour day, week or month. Under the expanded view for Total consumption, there's a measurements menu. You can drill down into detailed daily power consumption that's recorded in approximately 10-minute increments. In my tests, I was able to export a single day's consumption records or Total Monthly consumption in .csv format via email. The short gallery below shows the detailed information that is available. Switching to other rooms, I checked energy consumption detail was available for other manufacturer's devices using the eve Energy app. The ConnectSense Smart Outlet, configured for the living room, showed the most detail. The screenshot below shows that the eve Energy app had access to the current energy data, but not any usage information beyond the state data. Rather than showing power (Watts), the data reported was in amps. Outlet one was 0.4 A and outlet was 0.3 A. The state times shows that both outlets had been energized (State timer) for 2044 seconds. The 0.4 A corresponds to the 48 W reported for Outlet one and the 0.3 A corresponds to the 36 W reported by Outlet Two in the ConnectSense app. The Koogeek Outlet (Bedroom) reported 18 W matching what was shown in the Koogeek app. No additional data was available to the eve Energy app. Like the ConnectSense app, the eve Energy app has a navigation bar across the bottom of each screen. I'll discuss each one briefly. The left most menu, At a Glance, addresses one of my complaints about the ConnectSense app. At a Glance, shown below, shows a summary of all devices by room. Optionally, you can tap the "All" link at the top right of the page to select individual zones. This could be useful if you had a very large HomeKit device installation. The Scenes menu combines the functions found in the ConnectSense Scene and Rules menus. To execute a scene, merely tap on the icon. It shows all scenes that have been created by any HomeKit device on the current iOS device. You can also create a scene and choose any combination of accessories and actions to include. One important thing to note: The eve Energy app is able to delete scenes, timers and rules created by itself, or any other application. This was a very handy feature, as I was able to clean up test rules, events, and timers from other applications. The Timers function is exactly like what I found in the ConnectSense app You create a timed event and select once or repeating. If you select repeating, you have the same options of minute, hour day or week. Once you select the trigger time for the event, you choose the scene name(s) you want to execute. Like the ConnectSense timer rules, you can't choose the days of the week, nor can you create a timer based on sunrise/sunset. The Rules feature is exactly like the ConnectSense Rules-based event. You configure a rule the same way: Select one or more triggers, select conditions that must be met (ConnectSense calls them constraints) and then select the scene(s) that you want to execute if all of the triggers and conditions are met. It takes a few tries and a little experimentation to get the hang of these conditional rules, but ones you conquer it, you can create some pretty powerful automation. This menu is arranged by room name in an order that you can select. The accessory names shown in this view are the Siri names. Each device can be turned on/off from this view. The settings menu allows you to configure settings not found in other menus. Here you can configure individual accessories, change their name, Siri name, room assignment icon assignment and find out information about the accessory. Guest Access lets you invite other users to control your HomeKit environment. You can also create groups of multiple accessories that you want to treat as a single accessory. The settings menu is where you set the Energy cost per KWh that is used to calculate total energy costs. The screenshot below shows the Accessories menu selected. The Koogeek Wi-Fi Enabled Smart Plug P1 is approximately the same size as the eve Energy Smart Plug. It features a single outlet and, like the other products in this roundup, can support loads up to 15A (1800W). The on/off switch is located on the top of the Koogeek P1. A single multi-color LED lights up behind the second "e" in the company logo. 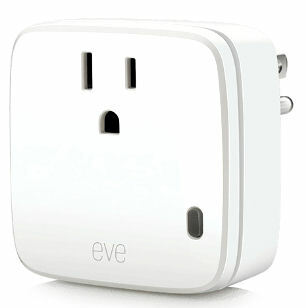 Unlike, the eve Energy, the AC power plug is centered on the back of the device, so when plugged into a duplex socket, it partially blocks the second socket. The Koogeek P1 was the third product that I installed. The setup process is supposed to be the same as the eve Energy, but I ran into a little problem. Rather than being connected to my home Wi-Fi network, my iPad had associated with another wireless network, so the installation failed. I reconnected to my home Wi-Fi network and reset the Koogeek P1 and tried to re-install it. It failed with an error message that said Adding Failed. Could not connect to accessory. I tried the reset/re-installation process several more times and still the installation failed. Finally, I wiped the HomeKit database and reinstalled all three products without incident. In addition, I also reinstalled the iHome ISP5. It's only a guess, but perhaps the HomeKit database got corrupted by the failed installation. The software for the Koogeek P1 has the fewest features of the three products in this review. When you launch the program, you land on the accessory page shown below. Each HomeKit accessory is displayed by room using its Siri Name. While the software recognizes rooms and allows you to create rooms, I didn't find any support in the product for Zones. Previously setup Zones didn't appear within the software. From this screen, you can turn on/off any of the installed HomeKit accessories. 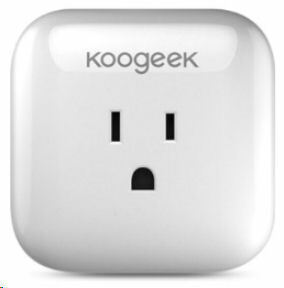 Note, however, that the Koogeek P1 didn't find the second outlet (Outlet Two) on the ConnectSense Smart Plug. It didn't seem obvious, but if you place your finger to the left of the on/off toggle for an accessory and drag left, you have the option to edit the Siri name or to delete the accessory. However, the software is already displaying the Siri name, and the program defaults to the device hardware name. I clicked OK in the screenshot below, and the name for the accessory didn't change. Siri still responded to "Turn off Koogeek Outlet". By tapping the horizontal arrows, you can change room assignments or create a new room. If you tap on an accessory, you'll get a detailed page as shown below. At the top of the screen, there's an attractive toggle switch that allows you to turn on/off the device. In the details, you can see a bar graph showing the power consumed for the month of October. The current power load is 18W. If you tap on the October bar in the chart, you'll get another graph along with a chart that details daily usage. Unfortunately, this data can't be exported. The Koogeek P1 doesn't handle rules or timers like the other two products. Whereas each of the other two products recognized the rules created in other manufacturer's products, the Koogeek didn't see any of those rules. In the other products, timers and rules executed an action when the trigger conditions were met. And, of course, those scenes could include any of the installed HomeKit devices. For the Koogeek P1, all you can do is set a simple timer with a start and stop time and select the days of the week to repeat. You can set up to eight timers, but the timers only turn on or off the Koogeek accessory, and don't execute scenes. The timers set up for the Koogeek do not appear in the other two product's list of rules or events. However, each of the rules/events created in either the ConnectSense Smart plug software or the eve Energy software showed up in the other's software and was editable in both. The template for the outlet detail in the screen shown above appears for each of the installed HomeKit devices on their corresponding detail page. While the power switch works for the other manufacturer's devices, the Koogeek P1 software didn't read the power consumption in either the ConnectSense or the eve Energy products. The bar chart was empty, and the setting timeroption for non-Koogeek products was disabled. For the most part, the scene function worked in the Koogeek P1 as it did for the other two products. You could add a scene, as well as edit or delete any scene created by any of the two other products. Interestingly, when creating a scene in the Koogeek P1 software, the ConnectSense Outlet Two, which didn't appear on the Accessory page, was available as a HomeKit device to select. I could also edit the ConnectSense-created scene shown below. So, which one to buy? All three products perform their basic function, controlling power to a device plugged into them, just fine. The difference is in power monitoring and how good a job the app does as an overall HomeKit controller—at least for outlets. Let's look at the apps first. eve Energy is my #1 pick. It had the most fully-featured app, was easiest to use, had the most attractive user interface and best power monitoring features. All of the power information you could possibly want was available, and you can drill down to detailed records in 10-minute increments. Best of all, you can export consumption usage into a CSV file. The eve Energy is also the only product in this roundup that supports estimating energy costs. In fact, the eve Energy software also did a better job of reading the ConnectSense power registers than the ConnectSense application. The Koogeek P1 application did a fair job of reporting monthly and daily power usage but lacked the ability to export it. Of the three products, the ConnectSense's power monitoring capabilities in iOS 9.x were the weakest showing only current power usage, average power usage and time on or off. However, I expect we'll see that ConnectSense improves power monitoring in the iOS 10 release. The ConnectSense's app came in second. The app had plenty of features, but was somewhat awkward to use. For example, the Home menu showed only the device name, and not the Siri name. In Scenes, once you created a Scene, you are stuck with it. I didn't find a way to delete a Scene. In the Device menu, again, the Siri names were not used on the top level. Nor could you control other manufacturer's smart plugs without drilling down one additional level. There was no single place where you could see the status of all of your HomeKit devices at a glance. In the Rules menu, once you created a rule, you couldn't delete it. For an event- based rule, I discovered that once I specified a solar event as a constraint, there wasn't a way to delete it as a constraint. I realize that many of these UI complaints are "nits" and may have already been fixed in iOS 10 or may not exist in the Apple Home app. This leaves the Koogeek P1 app in third place. I'm not sure what HomeKit's requires for an app's ability to control other devices. But the Koogeek implementation was so bare bones that I suspect that it may not have met all of the standards. Every HomeKit device I've seen supports Zones, but there didn't appear to be zone support in the Koogeek software. Similarly, for simple timer rules, every other HomeKit device followed the format: If "trigger time", then execute scene(s). Koogeek's event timer only controlled its own device and didn't recognize rules created by the other to applications. Similarly, Koogeek's simple timer rules didn't appear to update the HomeKit database as neither of the other two products was aware of the Koogeek timer rules. Both the eve Energy and ConnectSense devices support conditional events and are able to read/edit rules created by the other's software. There was no event support in the Koogeek application. 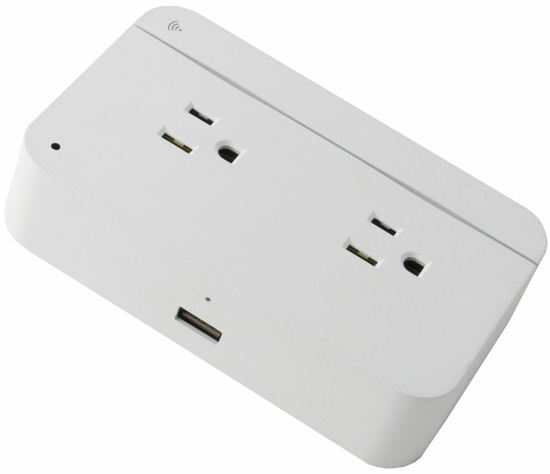 For the overall buy decision, the ConnectSense is the best value at $30 per controlled outlet, but both outlets are physically co-located. The Koogeek WiFi Smart Plug is the next best value at $35. Although I liked its app the least, it should be fine if your requirements are simple and you don't have other HomeKit devices to control. This leaves the Elgato eve Energy as the most expensive, but also the most fully featured choice. It's what I would choose if you are stuck in the iOS 9.3.5 world because Apple orphaned your old device and you can't (or don't want to) upgrade to iOS 10. The software is the best HomeKit software I've seen so far and its power monitoring capabilities blow away the other two products'. In fact, even if you decide to buy the ConnectSense or Koogeek, you might download and try the eve Energy software anyway.